Most reenactors know what beeswax looks like. 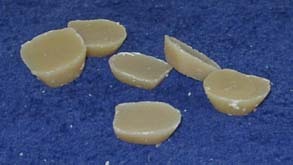 The wax we sell is pure beeswax and has not been stretched by adding any paraffin. Consequently, it will have a relatively high melting point and is not greasy. However, because of the natural impurities that give it its color, it can stain paper.